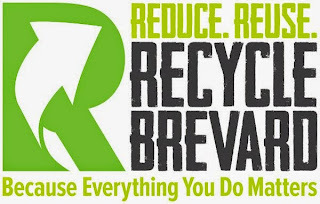 After a couple of years of volunteering in the community, it was time to properly incorporate and formally create Recycle Brevard, Inc. In 2013, Recycle Brevard became a Florida non-profit organization, receiving its 501c3 status in 2014. Our community volunteering work continued and it was not until 2017, though, that our founder and her husband were able to find a location to house our facility. They invested in getting a place for the organization so the community could benefit from having access to a facility where they could donate unwanted materials as well as somewhere to obtain those materials to be used in projects - crafts, art, school, church, neighborhood groups, families, you name it! On February 1st, 2017 we made Rockledge, FL our first home, opening our doors to the public on April 24, 2017. The goal of extending the life of those unwanted materials and diverting them from our landfills became more of a reality once we opened our facility. At our facility we also accept hard-to-recycle items, part of TerraCycle programs we participate in, being able to divert even more waste from our landfills. We work hard in disseminating information through various online channels, educational programs, community projects, presentations, outreach activities, public events, partnerships, and services. That is how we believe we can make things better: reduce waste, promote sustainable living, and build a stronger community by understanding, respecting and protecting our environment. We count on our wonderful volunteers and supporters to make it all happen. We are 100% run by volunteers and 100% funded by donations, sponsorships and the revenue from services we offer. We welcome anyone who would like to join our efforts. No matter your availability, expertise, or experience, we will welcome your help and support - we need all we can get and are very grateful for all that we already have. So far this is the story of a journey that started in 2011. It has taken all these years and many, many baby steps to get where we are. We are looking forward to positive changes in the future and would like to invite you to join us in our efforts to make those changes happen.